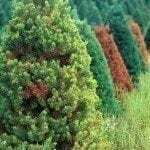 If I use roundup and salt to kill tree roots on the cut tree, will that affect the roots on adjacent trees which are Austrian Pines? Care needs to be taken not to spill or slash any chemicals onto the grass or other trees. If you carefully paint the cut root ends then only those roots will take up the chemical.